BRUSSELS --- The Intermediate-Range Nuclear Forces (INF) Treaty has been crucial in upholding NATO's security for over 30 years. 2. Allies have concluded that Russia has developed and fielded a missile system, the 9M729, which violates the INF Treaty and poses significant risks to Euro-Atlantic security. We strongly support the finding of the United States that Russia is in material breach of its obligations under the INF Treaty. 3. For over five years, Allies and the United States in particular, have repeatedly raised their concerns with the Russian Federation, both bilaterally and multilaterally. As we stated in the Brussels Summit Declaration in July, Russia has responded to our concerns with denials and obfuscation. Russia only recently acknowledged the existence of the missile system, but without providing the necessary transparency or explanation. 4. The United States has remained in full compliance with its obligations under the INF Treaty since it entered into force. Allies have emphasized that the situation whereby the United States and other parties fully abide by the Treaty and Russia does not, is not sustainable. 6. Russia's violation of the INF Treaty erodes the foundations of effective arms control and undermines Allied security. This is part of Russia's broader pattern of behaviour that is intended to weaken the overall Euro-Atlantic security architecture. 7. Allies are committed to preserving strategic stability and Euro-Atlantic security. 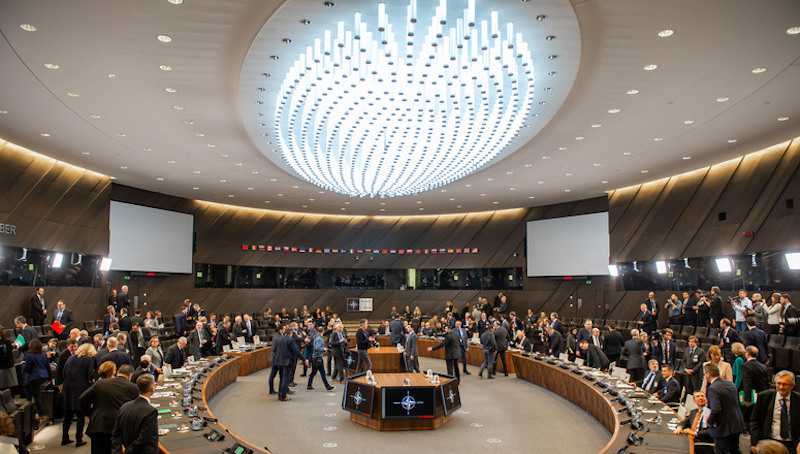 NATO will continue to ensure the credibility and effectiveness of the Alliance's overall deterrence and defence posture. 8. We will continue to consult each other regularly with a view to ensuring our collective security. We will continue to keep the fielding of Russian intermediate-range missiles under close review. 9. Allies are firmly committed to the preservation of effective international arms control, disarmament and non-proliferation. Therefore, we will continue to uphold, support, and further strengthen arms control, disarmament and non-proliferation, as a key element of Euro-Atlantic security, taking into account the prevailing security environment. 10. We continue to aspire to a constructive relationship with Russia, when Russia's actions make that possible. As most recently confirmed at the Brussels Summit, we remain open to dialogue with Russia, including in the NATO-Russia Council. 11. We call on Russia to return urgently to full and verifiable compliance. It is now up to Russia to preserve the INF Treaty. In a new statement on the INF Treaty also released today, NATO foreign ministers collectively declared for the first time "that Russia has developed and fielded a missile system, the 9M729, which violates the INF Treaty. The ministers also stated: "It is now up to Russia to preserve the INF Treaty." In delivering the Trump administration's ultimatum, Pompeo expressed the "hope" that Russia will "change course" and return to compliance with the treaty. Notably, the NATO foreign ministers’ statement does not express support for, or even reiterate, Pompeo's ultimatum that the United States will suspend its obligations in 60 days unless Russia returns to compliance. Click here for the full story, on the ACA website.